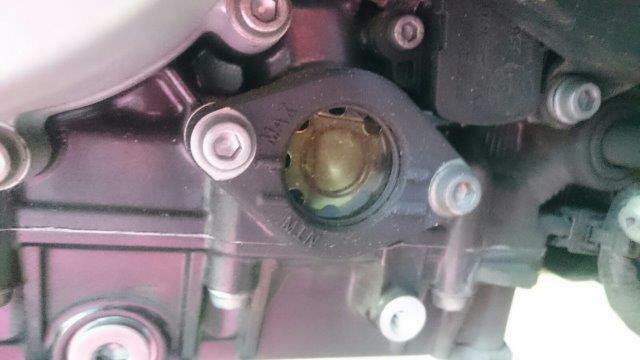 I don't pretend this is a difficult task that really needs much explanations, but I realize a lot of the G310R owners are new comers in the world of motorcycling and I thought I could share one of the easiest, yet essential, maintenance task: oil change! I also don't mean to refrain anyone going to its dealer to have this done. To each his own, I just prefer to handle all the tasks I can do myself, it's just something I enjoy. This way I am also 100% sure of what is being done on my bike. You won't save much time nor money doing this, but you'll probably gain some satisfaction and confidence along the way. Service manual also describe pretty well how to do this, but sometimes it's fun to have real-life experience and pictures on the side. So let's start. 1- First step is fun, just ride your bike around the corner so the oil gets hot, it will get out of the engine easier this way! 2- Gather the parts and tools. From left to right on the picture. Costs in Canadian dollars. 3- Have the bike to stand upright. 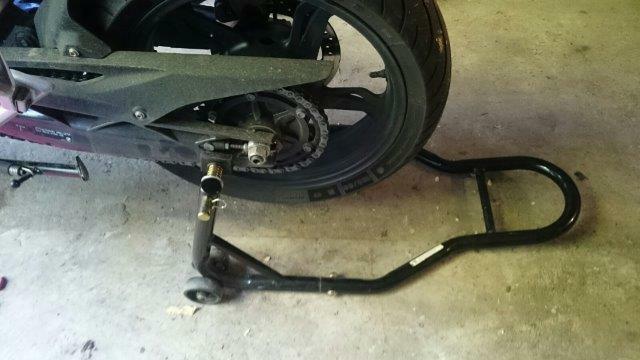 I use a standard rear-wheel stand for that purpose. 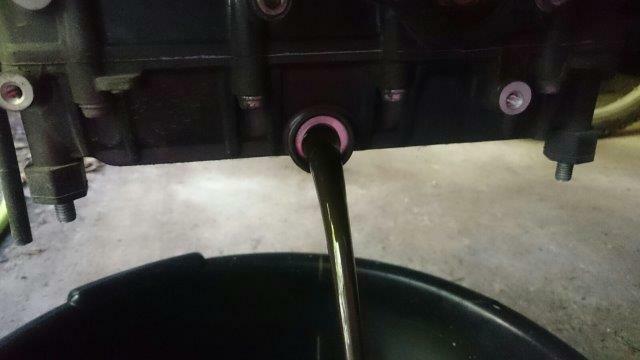 4- Remove the skid plate. Put your head down and look under your bike for the first time! 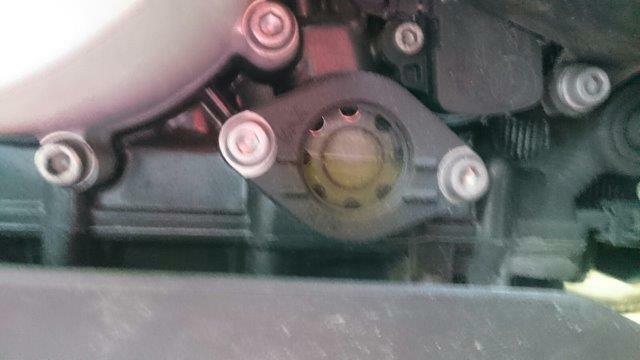 There are 4 nuts to remove there using the 12mm socket/wrench. 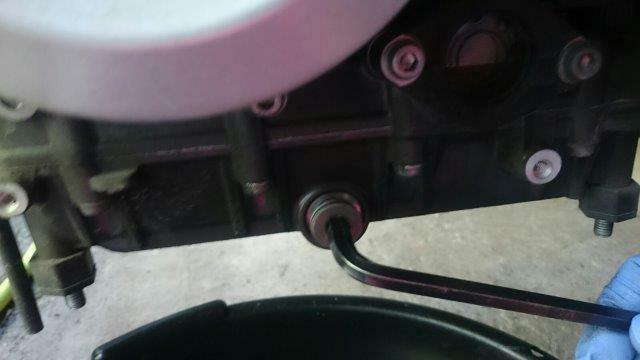 5- Place the drain pan under engine and unscrew the drain plug using the 8mm allen wrench. 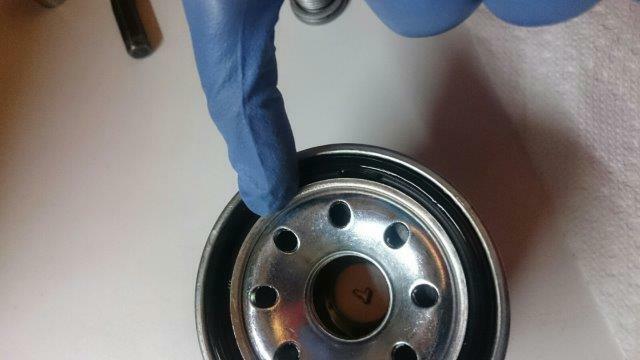 7- Unscrew the oil filter. Sometimes you can manage with bare hands but it seems mine was tight enough that I needed the tool. 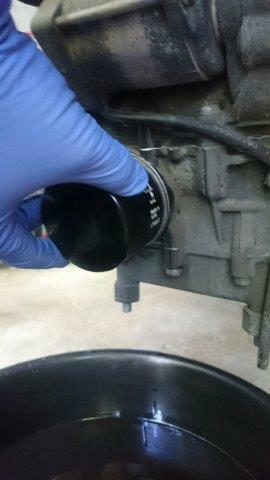 8- With your finger, put a light coat of oil on the filter rubber seal. This will ensure it screws in nicely without snugging and making a perfect seal. 9- Screw new filter in place. Clean your hands (or gloves) first! Once the base of the filter touched the base of the engine casing, I was able to screw almost one full-turn (maybe 7/8 of a turn?) with my hands. This is tight enough. If you use the tool to screw it, make sure not to over-tighten. 10- Clean the drain plug and fit new crush washer. Crush washers are meant for allowing a perfect seal and they will "crush" a little bit, preventing you to over-tight the bolt. 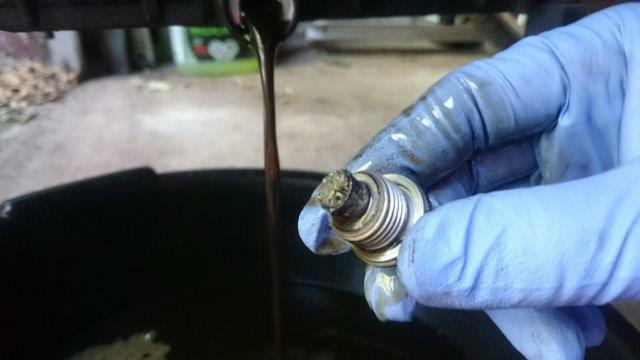 I often did not replace the crush washer systematically on each oil change, but I was told using the same crush washer over and over could damage the threads of the casing in the long run, it makes sense and for what they cost, I prefer to do it whenever possible. Recommended torque setting is 20Nm. I've done this so many times that I go on these by "feeling". Now your feeling won't be the same as mine so in case of doubt, use a torque wrench (and make sure you know how to set it properly or else you won't be in a much better position!). 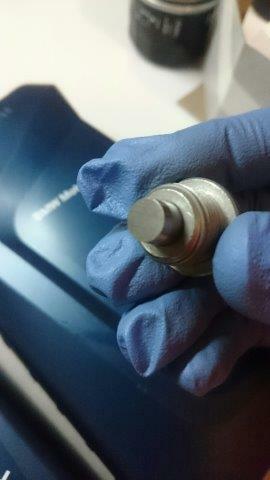 For more serious and precise engine work I will use a torque wrench, but for the drain plug not necessary in my case. 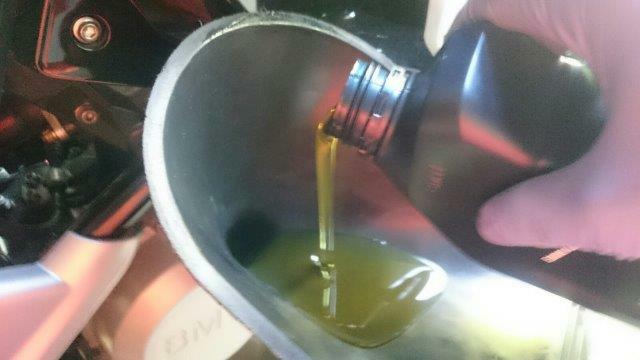 12- Pour some fresh new oil. 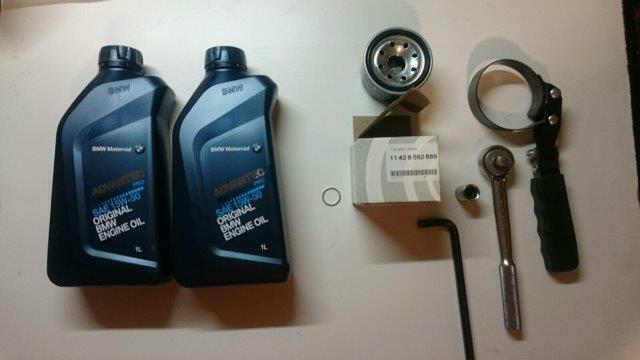 BMW Advantec Pro is supposedly a semi-syntetic oil blend. We know BMW does not produce its own oil, so there must be an equivalent in the big oil brands available for cheaper, but for now I'm sticking with it, at least for the time the bike is under warranty. BMW mentions 1.7 liter when for a complete flush and filter change. For now you might put a little less to make sure you won't have too much at the end. Before starting the engine, you'll notice the level seems too high, this is normal, there is no oil in the whole system (the filter is still empty). Use a rag and clean all traces of oil around the drain plug and the filter. 13- Start the engine for about 1 minute. 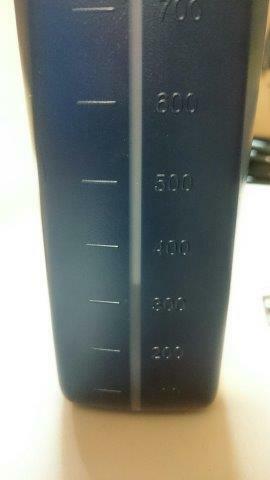 This is what was left my 2nd container, so I've roughly used .. 1660ml of new oil. Time to clean the floor, you don't want your tires to have any traces of oil on them. Oh and good idea to check after a real ride also when the oil is hot and that is how the manufacturer recommends you check the level. Hopefully I did not forget anything -- and do this at your own risk, I can't be held responsible if you FXXX up! LiquidCool, angiedave, MandatedMotorvation and 19 others like this. Last edited by heap; 09-13-2017 at 04:34 PM. Thanks for the step-by-step tutorial. Do you just wash the drainplug with some dish soap? I've seen my brother change the oil on his bike, but he doesn't really clean the plug. Just wiped it with a dry rag and it became like new. The idea is really to get rid of the small metal flakes that the magnet captured. LiquidCool and cfaircraft like this. Pretty thorough tutorial, thanks a "heap" man! BMW oil changes are the easiest in the world. I encourage any new riders to learn how to do this; no need to be afraid!!! 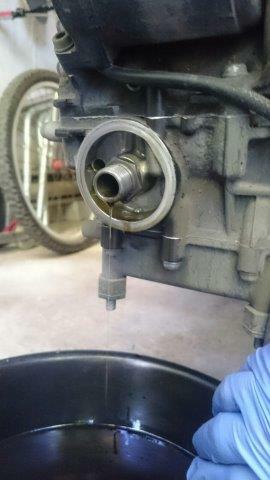 The oil change I had to do on my BMW F650GS single (now known as the G650GS) was a pain in the backside actually. I much prefer Honda oil changes which are simpler than my G310R which you have to remove the belly pan to drain the old oil. Beautiful article on oil change. Is it possible to make something similar for maintenance of the chain ? by checking the chain tension it is not clear how to do it. Bike on the side stand. 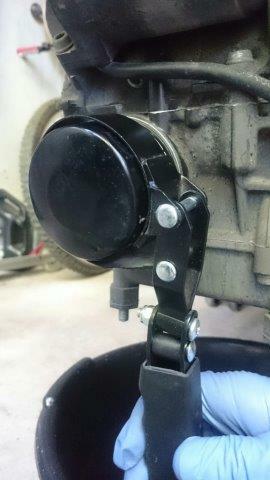 On the side stand the 'tension' should be between 40-50 millimeter (4-5 centimeter). I check the tension today (already drove appr. 1500 km after the first service) and found the chain was to tight (serviced at my dealer's). That might explain the worst changing of the gears ! The next two weeks I will be in the French and Italian alps with ..... the car. Unfortunately not on the Beamer because the misses Has also vacation and she wants to come too. 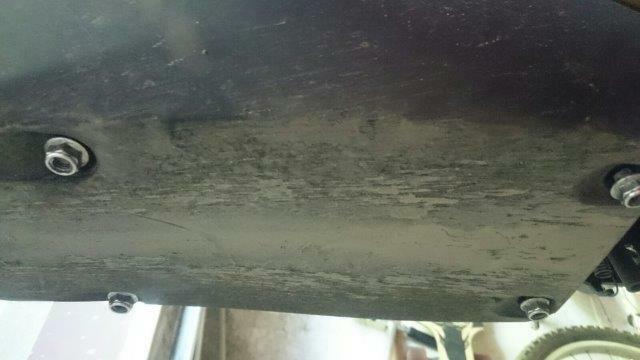 Great maintenance job to be doing and this is one of those thing that really make a forum like this what it is. Looking back at forums I used to be on, that's what I typically go back for now and they are what get the most views. Beautiful article on oil change. Is it possible to make something similar for maintenance of the chain ? As for your question the book is clearly mentioning the bike needs to be on side stand without weight on the bike when measuring the 40-50mm sag. cfaircraft and Bas310 like this.